(San Diego, California, USA): While most people who visit Helicopter Links website, simply use our website, we get calls and emails every month, from buyers searching for sellers in the helicopter industry. 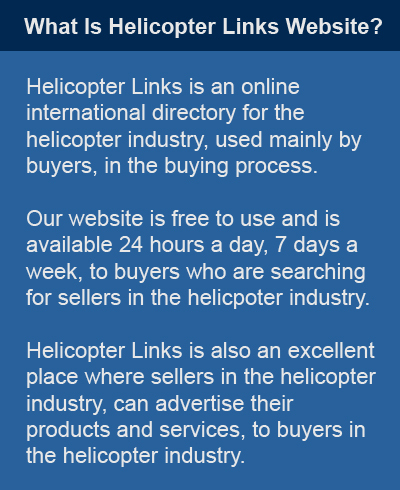 If you don't know already, Helicopter Links is a directory website made for the helicopter industry. We have about 70 different web pages (or categories) of helicopter companies, manufactures, associations and suppliers where helicopter related companies can take out advertising. We know that 80% of our visitors are buyers, searching for sellers because our web statistics show that about 80% of our visitors are using two (2) or more search terms in a search engine, then find Helicopter Links website, and then use our website to find companies. However, some buyers call us and email us, from around the world, looking for helicopter operators for construction, helicopter engine repair, rotorblades, parts, parts repair, air charter, tours and types of requests like these. And people also call us when they need to purchase new and used helicopters, purchase spare parts, aviation instruments, lighting, have engines refurbished, need to build heliports and things of this nature. Here is a list below of all the phone calls and emails we received in 2017 from buyers around the world, searching for sellers in the helicopter industry. Needed to purchase 6 new helicopters in the USA. I think it's important to remind you that the above requests are only the ones that we've received by phone and email. Most of the thousands of visitors coming to our website each year, will use Helicopter Links website, and not contact us directly but look at the advertising to find the companies they need to purchase from. Which is why companies with banner ads, get more attention from our visitors. Banner ads stand out among the listings and always get more clicks than those companies with simply one free listing. It's also important to realize that it's impossible to know what buyers need to purchase what items or services and when. However, when a company is advertising on Helicopter Links, year after year, you'll be available to buyers when they are ready to buy from your company. Helicopter Links visitors are from inside and outside the helicopter industry. This is an important point for helicopter operators and other companies who want to advertise their parts, supplies and services to the helicopter industry. Our visitors from outside the helicopter industry include companies such as: contractors, construction companies, demolition companies, government agencies, pipeline companies, utility companies, oil companies, private citizens and more looking to purchase the services from helicopter operators. Those companies from inside the helicopter industry are looking for helicopter replacement parts, repair services, completion service (a complete new interior for a helicopter), painting services, air charter, tours, filming services and things of this nature. And remember, many people from the helicopter industry are using Helicopter Links to find information about helicopter trade shows, helicopter magazines, helicopter associations and helicopter museums and will see your advertising when on our website. When companies take out advertising on Helicopter Links, you are telling buyers that you are open for business and that you want to earn their business. Companies without advertising can easily get lost among the listings because they have no banner ads and only a free listing. The nice part of advertising on Helicopter Links, is that our visitors want to look at your advertising. We make your banner ads at no charge or you can make your own ads. If you are are a helicopter operator, selling a product or providing a service in the helicopter industry, and want your company to be seen by buyers in the buying process, searching for your company, then Helicopter Links is where we'd recommend you take out advertising. I hope this article helps you see the advantages on advertising with Helicopter Links website. Please feel free to call me to discuss your advertising needs, our advertising options and prices at +1 (858) 413-7074 (San Diego, California, USA) or email us at staff@helicopterlinks.com.